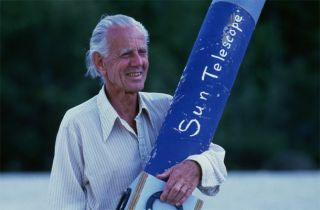 John Dobson, who revolutionized the design of amateur telescopes, holds his daylight-safe sun telescope at Strathcona Park, Ottawa, Canada, in 1988. I became interested in astronomy 10 years-old when I saw Saturn through a telescope at my local astronomy society. As a youngster interested in astronomy, cash was in limited supply so as I grew older, my parents helped to subsidize an attempt at making my own telescope. It was a 15 centimeter Dobsonian Newtonian reflecting telescope. The "Newtonian reflector" phrase describes the optical design of the instrument, while the term "Dobsonian" refers to the style of the mount. It was a beautifully simple style of mount that allowed even me as a young teenager a chance at making one myself out of wood. John Dobson was born in China on Sept. 14, 1915, and his family moved to California in 1927. There he spent 23 years in a monastery even though as a teen he was a self-proclaimed 'belligerent atheist.' He achieved a Masters Degree in Chemistry in 1943 at the age of 28 and just a year later became a monk of the Ramakrishna Order. Because of his growing interest in the Universe, he was tasked with reconciling astronomy with the teachings of the Order. This ultimately led to him developing an interest in building simple telescopes through which he would share the views of the heavens with neighbors of the monastery. His sideline interest in telescope building led him to communicate with others outside the monastery that were interested in his work and for this, he developed a code to attract less attention. Instead of referring to telescopes, he wrote about 'geraniums' instead; a 'potted geranium' was a telescope that was fitted to its rocker box (part of the Dobsonian mount) and a 'geranium in bloom' was a telescope that had an aluminumized mirror. Clearly his passion was elsewhere, so he was forced to choose between the monastery or his telescopes. Thankfully for the rest of the world, he chose the latter. Dobson's telescope design soon became world renowned amongst amateur astronomers who continue to this day to build his telescope. The simplicity of the design makes them cheap to build so a popular choice among newcomers, but the design is scalable allowing the design to work well for large instruments. In fact, among amateur telescopes, I don't think I have seen many telescopes over 35 centimeters aperture that are not of the Dobsonian design. Sadly, John Dobson passed away last month on Jan. 15, 2014 at the age of 98. Not only did he leave behind one of the most revolutionary telescope designs but he also leaves behind a wonderful trend in taking astronomy and the beauty of the Universe out to the people. In 1967 he co-founded the San-Francisco Sidewalk Astronomers. The concept was simple: take some simple telescopes, set them up on the sidewalk on a clear night and let passes by look through them and discuss the wonders of the night sky. Over the years, Dobson inspired thousands of people not only to look up to the heavens but also to have a go at building their own telescopes. What a wonderful legacy, left behind by a truly inspirational man; a man that in my opinion is without doubt one of the grandfathers of modern amateur astronomy.